American model Ondria Hardin, Lincoln Centre, NYC, September 2013. Easy weekend style: a simple cropped tee + skinny cropped trousers + sneakers. 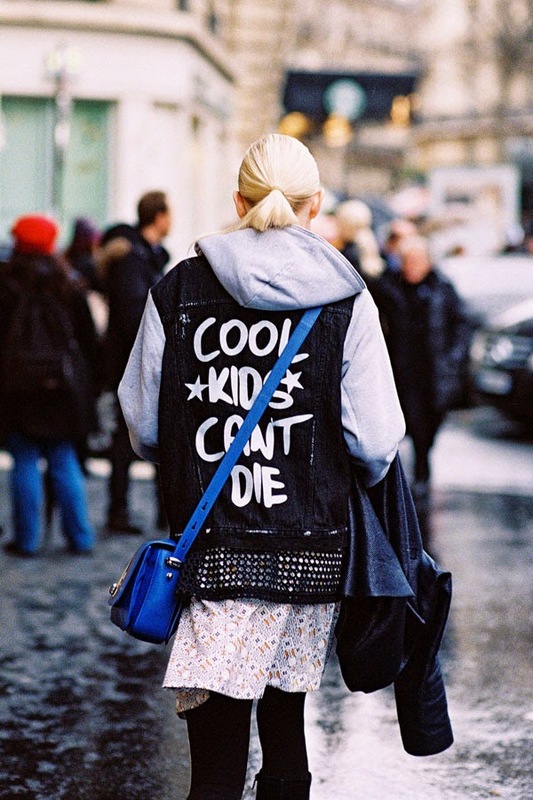 Stylist Pernille Theisbaek of Look De Pernille, after Acne Studios (I think! ), Paris, March 2014. A sophisticated way to wear culottes/cropped pants/gaucho trousers (or whatever you choose to call them! ).Team with a fitted jacket + fabulous lace up sandals/boots! Pants: Tibi pleated pants, Adam Lippes Denim wide-leg culottes, J.W. Anderson cropped wool trousers, Topshop Diamond spot culottes, Warehouse culotte, Proenza Schouler wide-leg sailor pants, Tome belted culottes, or Whistles tiger print culottes (these would look fab with the same tone of jacket as Pernille is wearing). After A Show, Tuileries, Paris, October 2013. 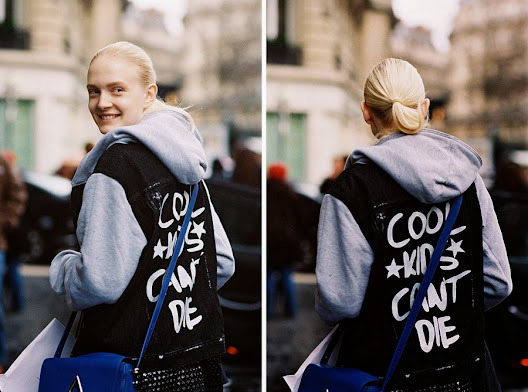 Before Stella McCartney, Paris, October 2013. 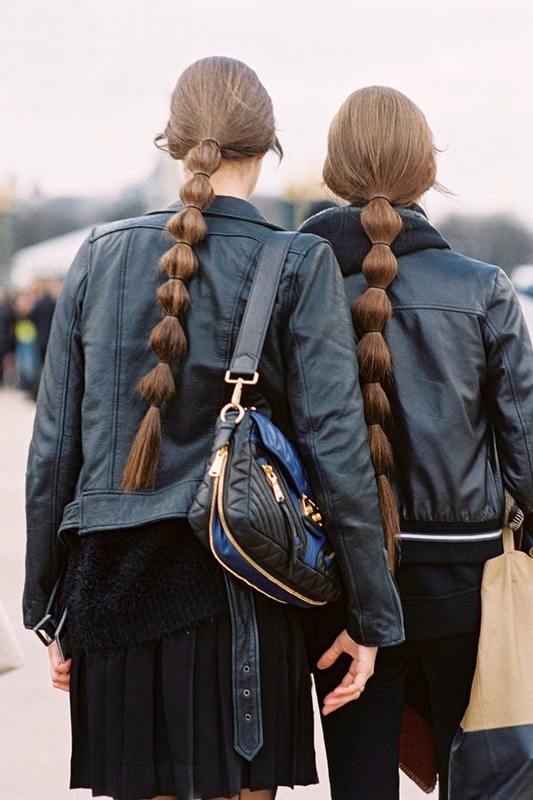 Weekend hair inspiration via Valentino, Paris, March 2014. DJ Leigh Lezark, before Viktor & Rolf (wearing Viktor &Rolf white mini dress), Tuileries, Paris, February 2014. Fashion Consultant Yasmin Sewell, after Balmain (and Carven! 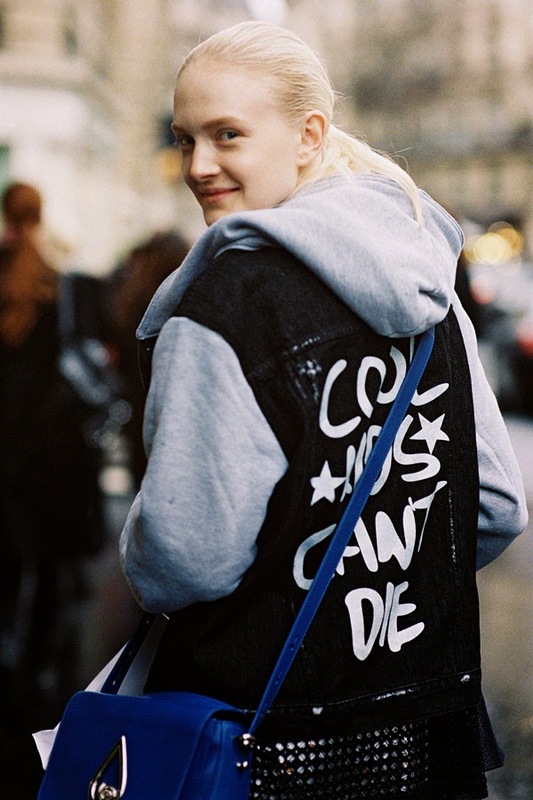 ), Paris, February 2014. Adore Yasmin's longline jacket (almost like an exaggerated length tuxedo jacket) with rolled hem jeans, sportswear-inspired top and gorgeous silver pumps. And her fab plaid umbrella.... the kind of umbrella I would lose within two days of purchase! 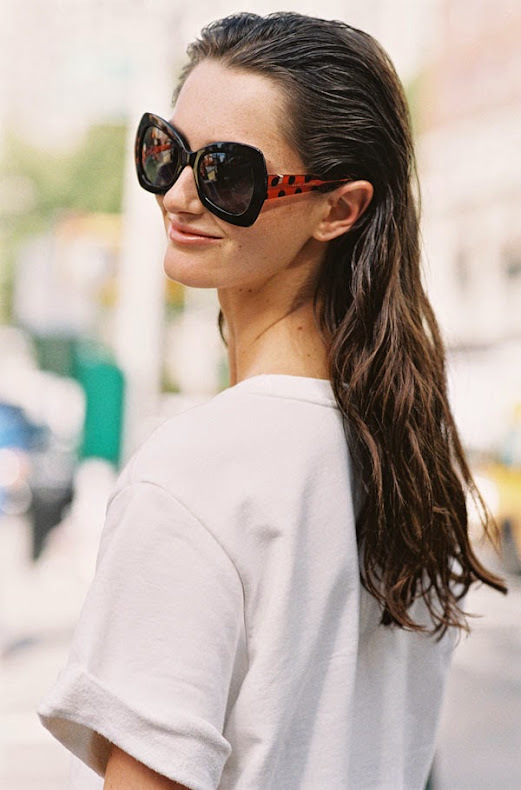 French model Marine Deleeuw, after Tommy Hilfiger, NYC, September 2013. Cute overalls and chunky sandals for summer! American model Mackenzie Drazan, after A Show, NYC, September 2013. 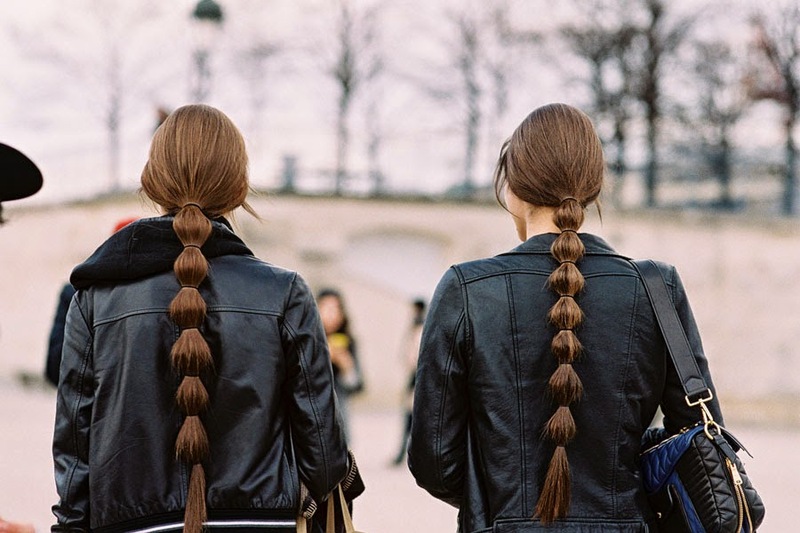 Helena Bordon, Tuileries, Paris, March 2014. Smart city shorts dressed up with white pumps and a beautiful gingham coat. Chinese model Ming Xi, after A Show, Paris, February 2014. Australian model and actress Maddison Brown, after Jason Wu, NYC, September 2013. 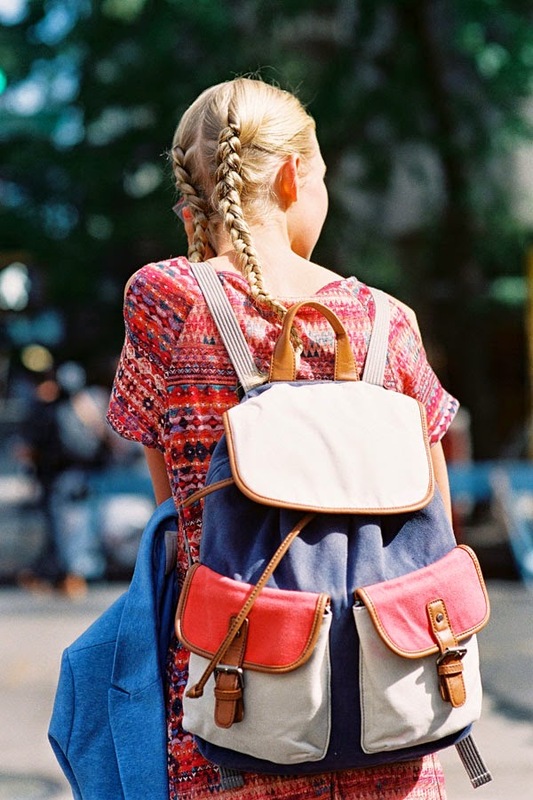 You can't go wrong with super cute coloured denim shorts, faded denim jacket and flat ankle boots for casual summer. 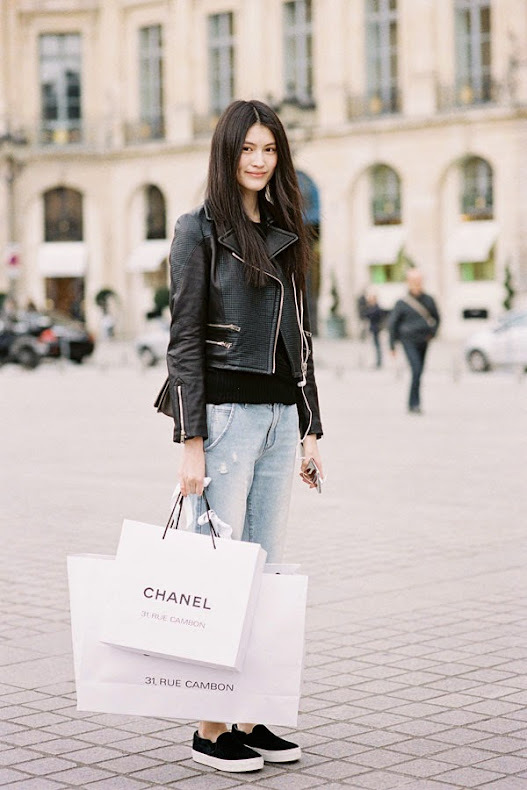 Chinese model Sui He, Paris, March 2014. The Editoralist's Kate Davidson Hudson, before Delpozo, NYC, September 2013. A beautiful way to wear neutrals....accessorise with gorgeous animal print accessories. 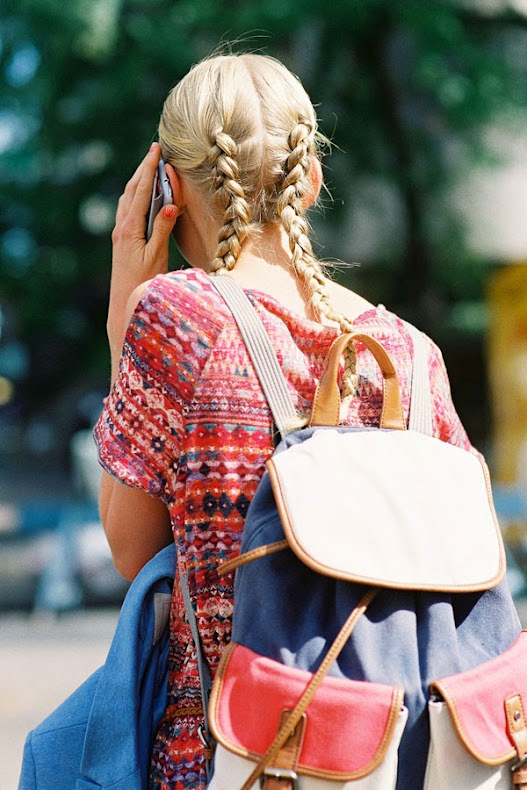 Weekend Hair inspiration via NYC, September 2013. Cute plaits for the weekend! Christina Perez, Style Development Editor, Glamour magazine, NYC, September 2013. The way to wear a bustier or crop top this season....over a shirt or top! Yasmin always wears the look beautifully here. Buro 24/7's Nasiba Adilova, before Allude (I think! ), Paris, October 2013. The perfect dress for a hot summer's day.....and for those who have overindulged in Easter eggs, hot cross buns and other Easter treats! 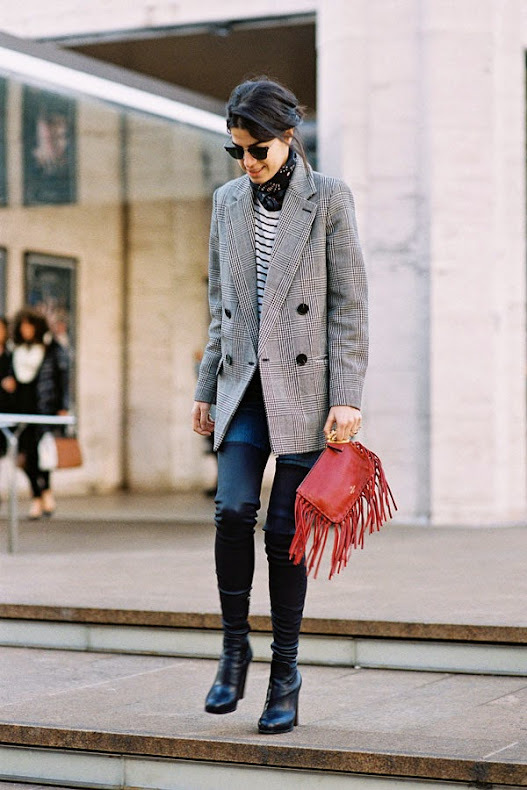 Leandra Medine of The Man Repeller, Lincoln Centre, NYC, February 2014. Fringing, an oversized menswear inspired blazer and a neck scarf. So chic. 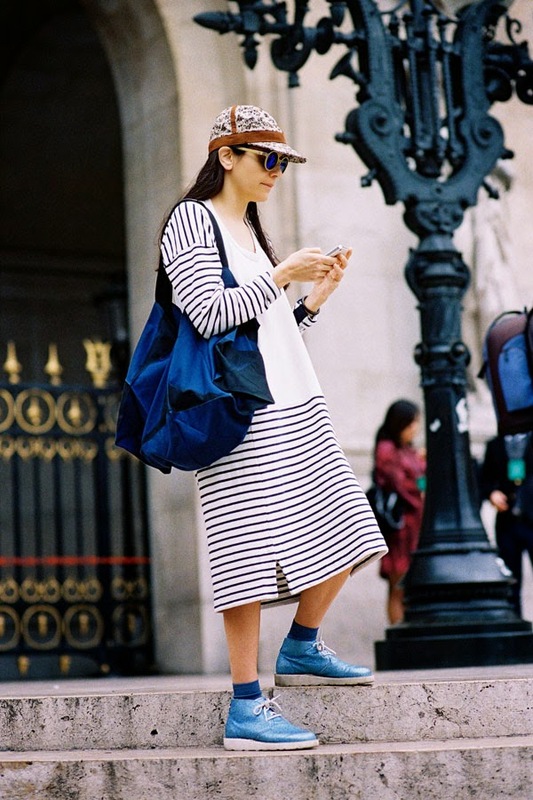 Chinese model Sissi Hou, after Kenzo, Paris, February 2014. "You are Gold...you're indestructible, always believe in, 'cos you are...Gold"
Polish model Maja Salamon, after Giambattista Valli, Paris, March 2014. Valentina Siragusa of Factory Style blog, after Stella McCartney, Paris, March 2014. Sofie Valkiers of Fashionata blog, Tuileries, Paris, March 2014. Shades of lemon chiffon, pretty gingham, and transparent protection from the April showers. Well hello there spring!